"This Is The One caused the most problems. There was always a big question as to whether it should go on the record. It worked real well live, a bombastic thing that got faster and faster and was a bit Nirvana-ish. But we had to work hard on getting the dynamics right and making the speed changes work smoothly. I Am The Resurrection took a bit of time too. We wanted something epic to end the album and that was the song they'd been ending the live set with, so we literally built that massive crescendo piece by piece." The song's title, which is looped at the end in a swirling climax, is taken from the prophecy of John the Baptist, in 'Jesus the Lamb of God'. The ministry of John the Baptist lights the way for Israel to see and accept its Messiah. What The World Is Waiting For. The next day John saw Jesus coming toward him and said, "Look, the Lamb of God, who takes away the sin of the world ! This is the one I meant when I said, 'A man who comes after me has surpassed me because he was before me.' I myself did not know him, but the reason I came baptizing with water was that he might be revealed to Israel." "This is the one I've waited for...". 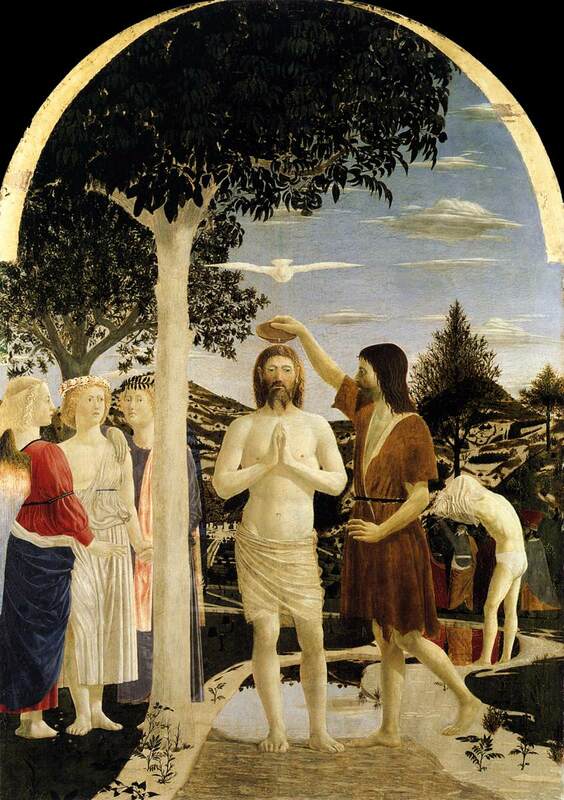 'The Baptism' (1442) by Piero della Francesca (c. 1415 - 1492). Jesus was the one that Mary had waited for ("This is the one she's waited for"). 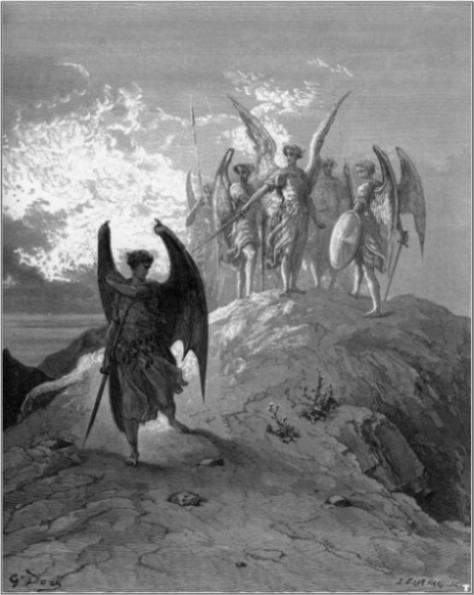 The verses, I propose, alternate between the birth of Jesus and Lucifer's expulsion from Heaven. 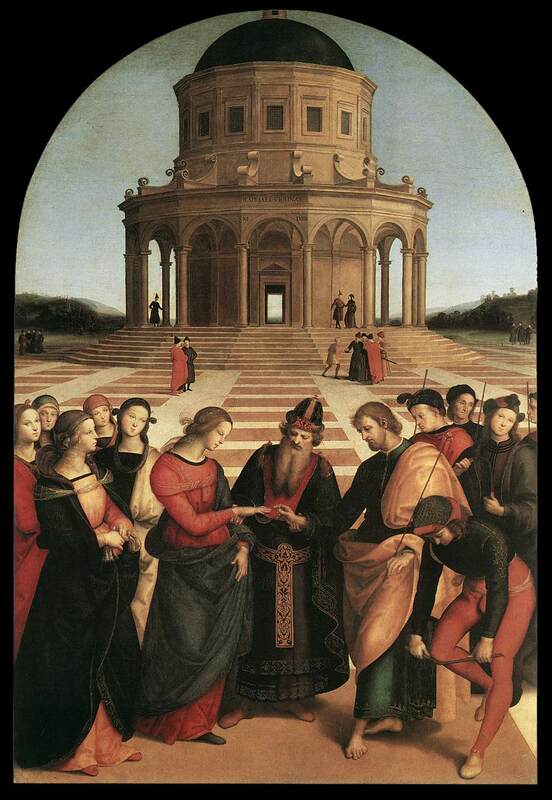 For example, the lyric "I have her on a promise" pertains to Mary being espoused to Joseph; Joseph had Mary 'on a promise' of marriage. 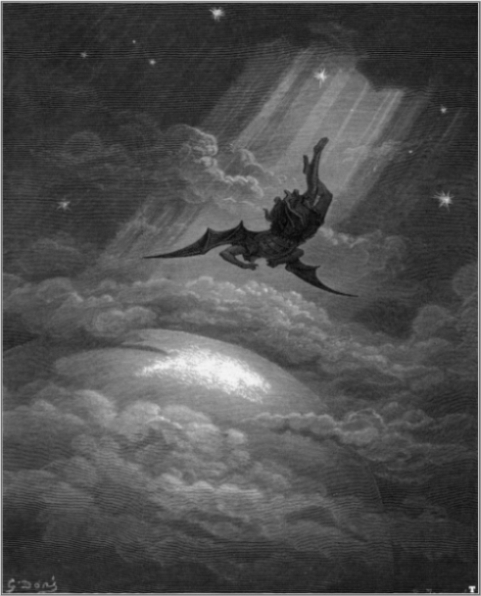 'The fall of Lucifer' (left) and 'Lucifer' (right), Gustave Doré (1832 - 1883) illustrations for 'Paradise Lost' by John Milton. And it came to pass in those days, that there went out a decree from Caesar Augustus that all the world should be taxed. The Decree by Art Garfunkel may have been an inspirational spark here (From Galilee to Bethlehem / She journeyed with only a donkey to ride...). Top: 'Annunciation' (1472 - 1475) by Leonardo da Vinci (1452 – 1519). Middle: "With only but a donkey...". 'The Census in Bethlehem' (1566) by Pieter Bruegel the Elder (c.1525 – 1569). 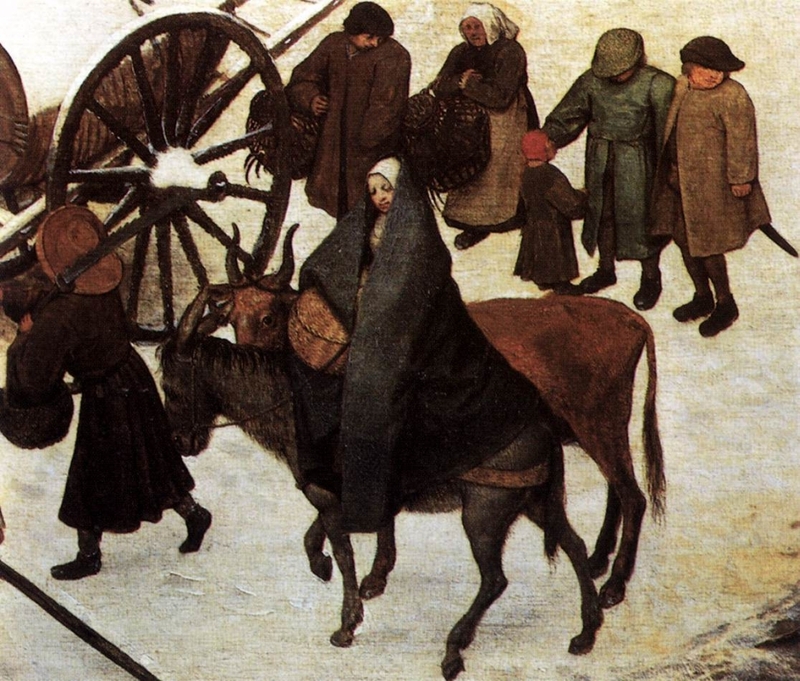 Bruegel's painting of The Census in Bethlehem is filled with men, women, children and animals. Although entitled 'The Census in Bethlehem, Bruegel sets it in a busy Flemish village in winter, bringing home the story for himself and his audience. 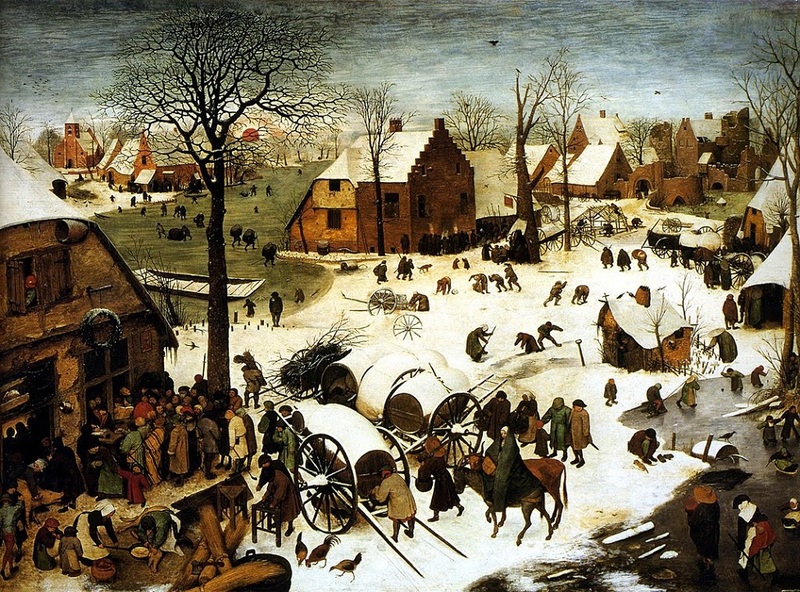 Bruegel's art unifies this random bustle. No obvious focal points direct us as we look at the painting, because Bruegel wants us to enter into the village and orient ourselves as visitors would have done. When we get our bearings we notice that a crowd of people is collecting in front of the building in the foreground left. Just inside, some men sit at a table examining documents and making notes in a ledger. The villagers crowd around, waiting their turn. Surveying the work from left to right, one notices two large wooden O's made by the wheels of some hay wagons. The circle has been universally accepted as the symbol of eternity and everlasting existence; as the monogram for God, it stands for both the perfection and the eternity of God. Then we notice a young woman on a horse led by a man on foot. The woman is almost hidden by her heavy winter clothing. But we realize this is Mary, and suddenly we are aware of how mundane events can be transformed into miracle. 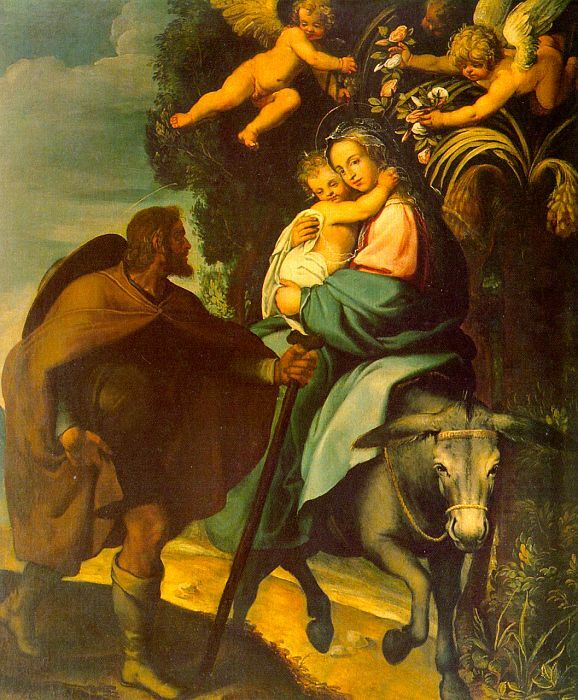 Bottom: 'The Flight into Egypt' (1600 - 03) by Bartolomeo Carducci (1560 – 1608). The song makes several references to a 'plan' which might go wrong. Would Mary and Joseph accept the abrupt news from the angel of the Lord that Mary would give birth to the Son of Man ? The law in the first century stated that a betrothed women who became pregnant as an adulteress was subject to death by stoning. The lyric, "I'd like to leave the country for a month of Sundays" refers to Joseph leaving Nazareth, Galilee, to go to Bethlehem, Judea. This was prompted by Caesar Augustus, the first Roman Emperor, issuing a decree calling for a census to be taken of the entire Roman world, with everyone having to go to their own town to register. 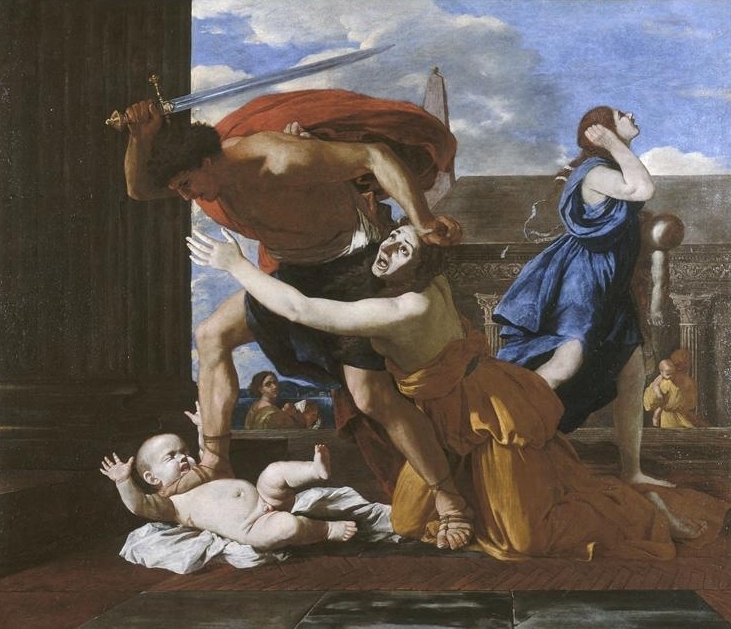 'The Massacre of the Innocents' (1629) by Nicholas Poussin (1594 - 1665), painted at the height of the Thirty Years War. Bellona was an Ancient Roman war goddess, who represented the frenzy of battle and was variously identified as the wife, sister, or daughter of Mars. All Senate meetings relating to foreign war were conducted in the Templum Bellonae (Temple of Bellona) on the Collis Capitolinus, outside the pomerium. The name 'Bellona' derived from the Latin word for 'war' (bellum), and is directly related to the modern English word, 'belligerent' (lit., 'war-waging'). Near the beginning of Shakespeare's Macbeth (I.ii.54), Macbeth is introduced as a violent and brave warrior when the Thane of Ross calls him "Bellona's bridegroom" (i.e., Mars). 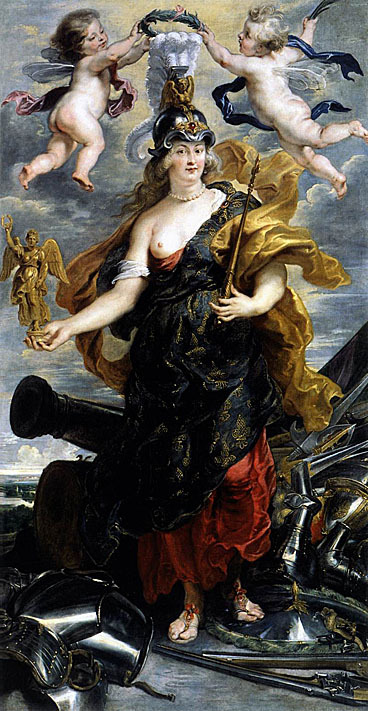 In art, she is portrayed with a helmet, sword, spear, and torch; the goddess has proved popular in post-Renaissance art as a female embodiment of military virtue. The name Bellona, the goddess of War, is present within the letters Belladonna; accordingly, Ian names first the goddess, then the plant. Bellona's priests used belladonna in religious ritual. For further evidence of this lyrical technique of 'encoding' within words, see Goodbye To The Broken. 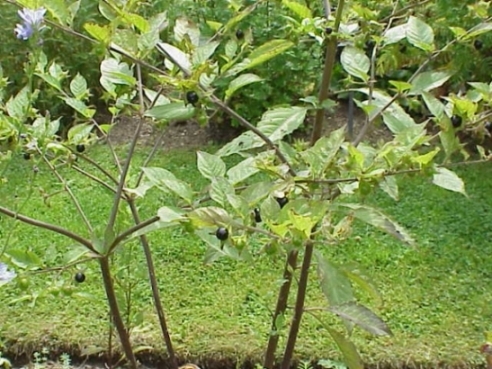 Top left: Atropa belladonna or 'deadly nightshade', a perennial herbaceous plant. The foliage and berries are extremely toxic, containing tropane alkaloids. These toxins include scopolamine and hyoscyamine, which cause a bizarre delirium and hallucinations. The drug atropine is derived from the plant. The genus name 'atropa' comes from Atropos, one of the three Fates in Greek mythology, and the name 'atropa bella donna' is derived from an admonition in Italian and Greek, meaning 'do not betray a beautiful lady'. In West European magick, this crone herb has been used for astral projection and is apparently an ingredient in flying ointments; even now, it is considered a witchcraft essential. Top right: Amaryllis belladonna or Belladonna Lily or 'naked ladies', a monotypic genus of plant. 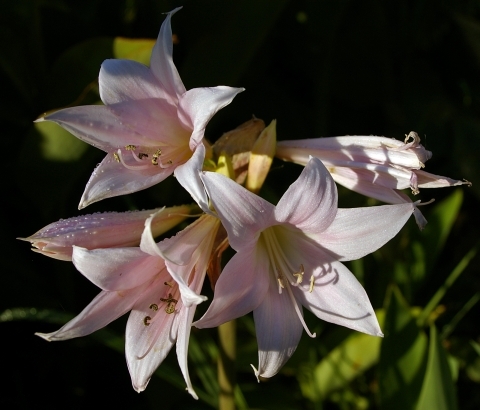 Amaryllis belladonna has religious connotations with the Virgin Mary, a central figure of this song. Bottom left: 'The Garden of Eden' (c. 1410) by an unknown German Master, in which the serpentine intertwinement of the two trunks of the trees on the left serves as a memory of Man's Fall. One of the many flowers associated with 'Mary's garden' is the aforementioed 'Amaryllis belladonna'. Another is the 'Madonna Lily', symbolic of Mary's purity, the flower presented to Mary by the Archangel Gabriel at the Annunciation (see 'Annunciation' above, by Leonardo da Vinci). The beauty of the lily is commented upon by Christ Himself (Luke 12: 27). 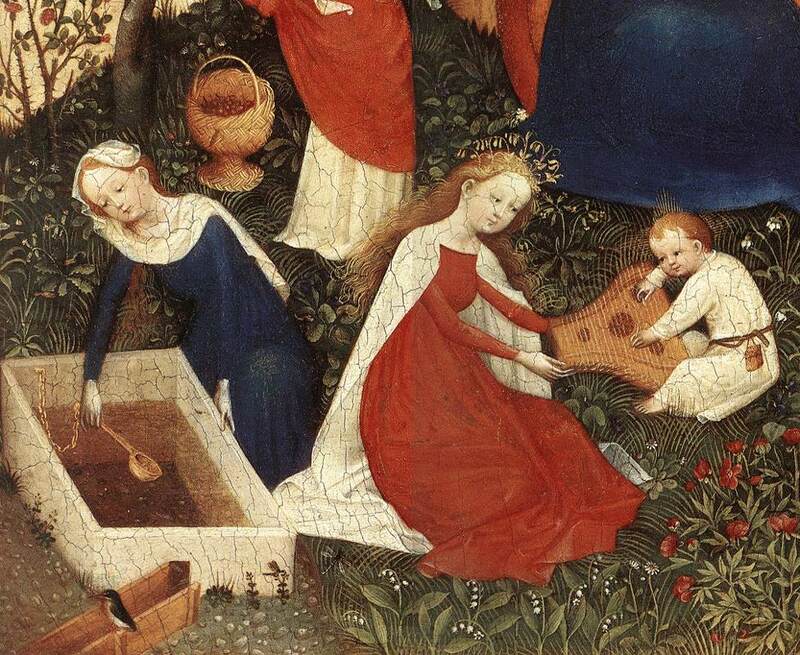 This garden is a harmonious scene of beauty, where angels play. The crowns are golden garlands of flowers, St Cecilia's grasp of the psaltery forms a mirrored symmetry to the instrument itself, and the parallel lines of grasses appear to be growing from the strings of the psaltery. 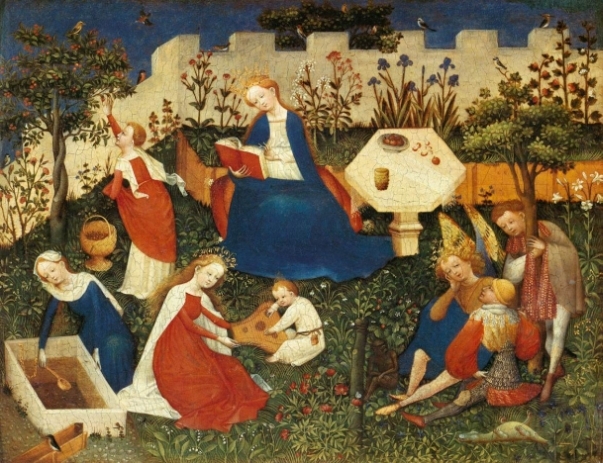 Pre-Reformation paintings of Mary and Jesus often place them in an enclosed garden (hortus conclusus) with St Anne and other female saints. They are a reminder that, while Christ's divinity came from God, His humanity came from female flesh. Bottom right: 'Marie de Medici as Bellona' (1622 - 25) by Peter Paul Rubens (1577 – 1640). 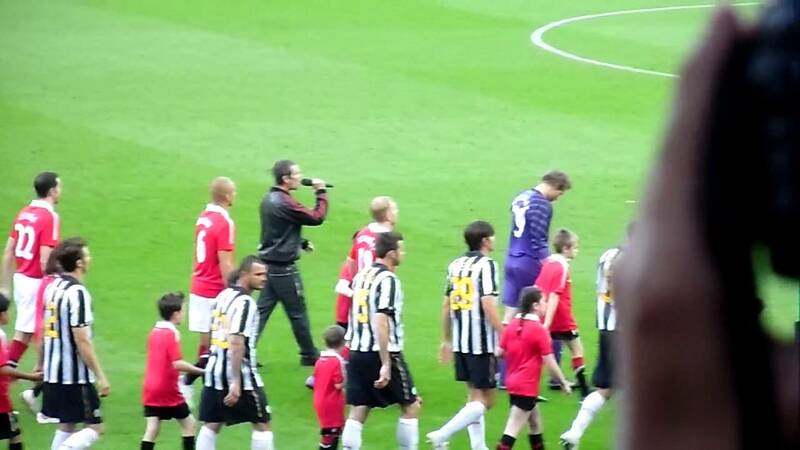 At home fixtures, Manchester United walk on to the Old Trafford pitch to This Is The One. For Gary Neville's testimonial in May 2011, Ian Brown sang the song a cappella for the player's entrance on to the pitch. Stone Roses lyrics are a feature of banners among the United supporters. Next to a 'One United - One Love' (referencing The Stone Roses song, One Love) banner at Old Trafford is another with the lyric, 'Sent to me from Heaven, you are my world' (from Sally Cinnamon) with pictures of George Best, Denis Law, Bobby Charlton and Duncan Edwards. 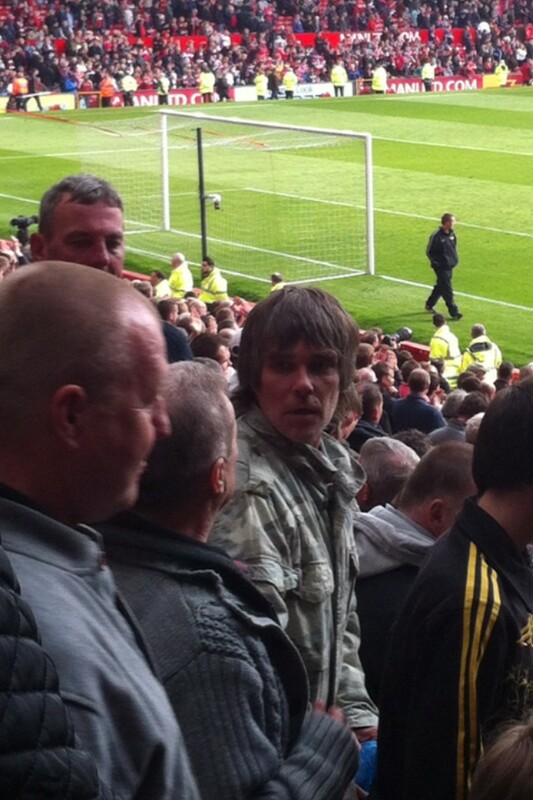 Ian Brown requested that his NME 'Godlike Genius' award in 2006 was presented to him by one of the club's treble winning side of 1999, Teddy Sheringham. Ian Brown's solo work continues to inspire banners, with 'MUFC: For EveryManc A Religion' (based on the acronym, F.E.A.R.). Stone Roses lyrics also feature on banners of FC United of Manchester, founded in 2005. One would imagine that Ian Brown and Mick Hucknall would not have been particularly approving of the career path chosen by Sylvan Richardson (who shares the exact same birthdate as Ian Brown - 20th February 1963) in July 2010. The former Simply Red guitarist, who was mooted to be replacing John Squire in The Stone Roses in 1996 (and was later Ian's bass player) became a masseur at Liverpool FC in 2010 ! Eric Cantona appears in the 2013 Shane Meadows documentary, Made of Stone. Both This Is The One and Waterfall feature in the 2013 Manchester United documentary, The Class of '92 (which includes an interview with Mani). 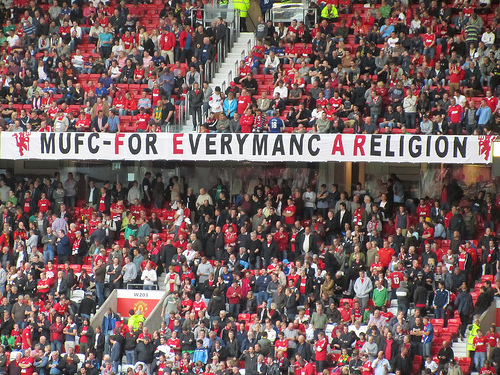 Top left: The F.E.A.R.-inspired 'MUFC: For EveryManc A Religion' banner. Top right: Man United banner inspired by both One Love and Sally Cinnamon. Another Stone Roses-inspired banner at Old Trafford simply has the word ADORED, with the letters RED highlighted in red. When John and Reni were informed of the band's victory in the Silvertone court case on 15th May 1991, there was double cause for celebration for John, as he was with Reni in Rotterdam to see Manchester United defeat Barcelona 2-1 in the European Cup Winners' Cup final. 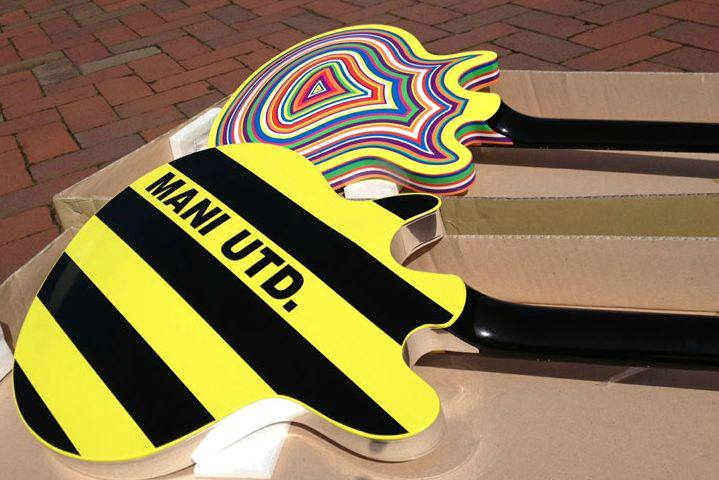 On the 2012 Stone Roses reunion tour, Mani had MANI UTD emblazoned on the back of his bass guitar. 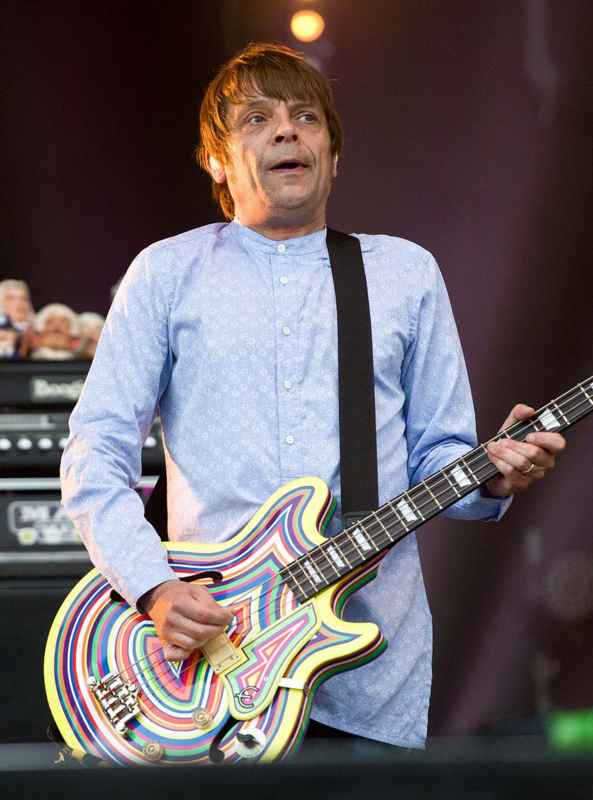 The two bass designs seen here were personally designed for Mani by artist Jim Lambie. 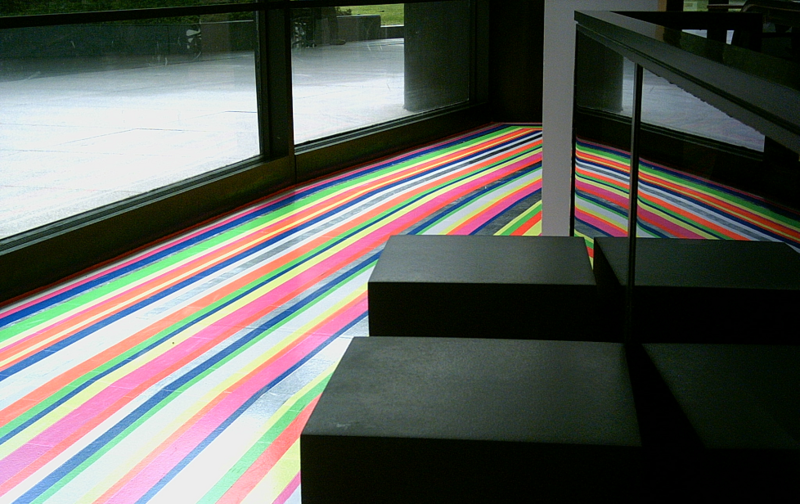 The second row shows detail of Lambie's installation at the Hirshhorn Museum and Sculpture Garden in Washington, D.C., which illustrates his typical use of coloured tape. Third row (left): FC United of Manchester banner inspired by I Wanna Be Adored. This alludes to Manchester United having 'sold their soul' to the Glazer family. After Manchester United F.C. was floated on the stock market in 1990, the high value of the club made it seem unlikely that a hostile takeover would be possible. Nevertheless, in June 2005, Malcolm Glazer succeeded not only in gaining control of the club through his takeover vehicle, Red Football Ltd., but converting it into a completely private company. Between 2003 and 2005, Glazer gradually bought out the shareholders in Manchester United in a deal that valued the club at around $1.47 billion. The takeover was fiercely opposed by many fans of the club, who organised themselves in the form of the independent 'Manchester United Supporters' Trust' (formerly 'Shareholders United'), partly because the Glazer takeover saddled the club with a large debt (over $850m) and interest that comes with it (approximately £60 million per year) but also because of many fans' belief that the club should be in the hands of fans and not businessmen. The escalation in ticket prices took place at a time when the club received more money than ever from TV and sponsorship deals. Since 2005, the ticket prices at Old Trafford have increased significantly, confirming MUST's fears that the fans' support would be the source of the finance to service the huge debt. In anger at the takeover, thousands of fans refused to renew their season tickets, instead coming together to set up a new club called F.C. United of Manchester. Third row (right): FC United of Manchester banner inspired by The Stone Roses' I Am The Resurrection. FC United of Manchester considers itself to be the 'Resurrection' of a 'dead' club. Penultimate row: In August 1986, five fans were stabbed on a cross-channel ferry to France after violence broke out between fans of West Ham and Manchester United. Mani was onboard the ferry, and was subsequently interviewed with friends on the news. The brawl, involving nearly 150 fans, broke out on the Dutch ferry Koningin Beatrix, when supporters of the two teams began trading insults in one of the ferry's crowded duty-free bars. The fans were journeying to the Netherlands to watch their teams in pre-season friendly matches, which did not fall under the European ban on English teams following Heysel. Sporadic fighting broke out and soon escalated, with some of the fans wielding knives and breaking bottles for use as sharp weapons. Others threw chairs and swung fire extinguishers at each other. About 2,000 terrified vacationers aboard the ferry locked themselves in their cabins. The Koningin Beatrix left Harwich for Hook of Holland at 10:30pm on Thursday 7th August, but when fighting intensified, the captain ordered his crew to lock the rioters in the bar, and turned the ship around at about 1am on Friday. Bottom row: One of John Squire's Celebrity artworks from 2011 is entitled 'David Beckham' (ink & oil on canvas, 90cm x 70cm). Squire explained the process of selecting names to the Daily Record in June 2011: "It's been difficult choosing the names to paint. I've tried not to make it a list of people I admire or people I despise. I have tried to make it as little about me as possible. I looked at lists of the top 100 celebrities and celebrity websites and I looked at magazines lying around the house. I tried to incorporate the obvious and throw a few curve balls in there. With the David Beckham one, I had seen an image of him in quite a restrained and muted outfit. There was a lot of brown and tan in there. Midway through the piece suggested that photograph and it seemed a good fit." 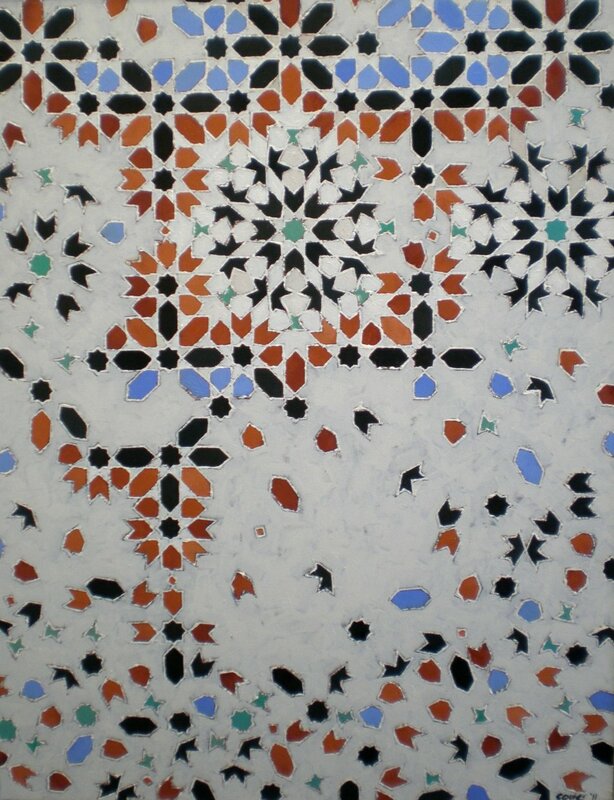 The eight-pointed stars in this work can take the visual form of a head or football, giving the impression of a formation of footballers. 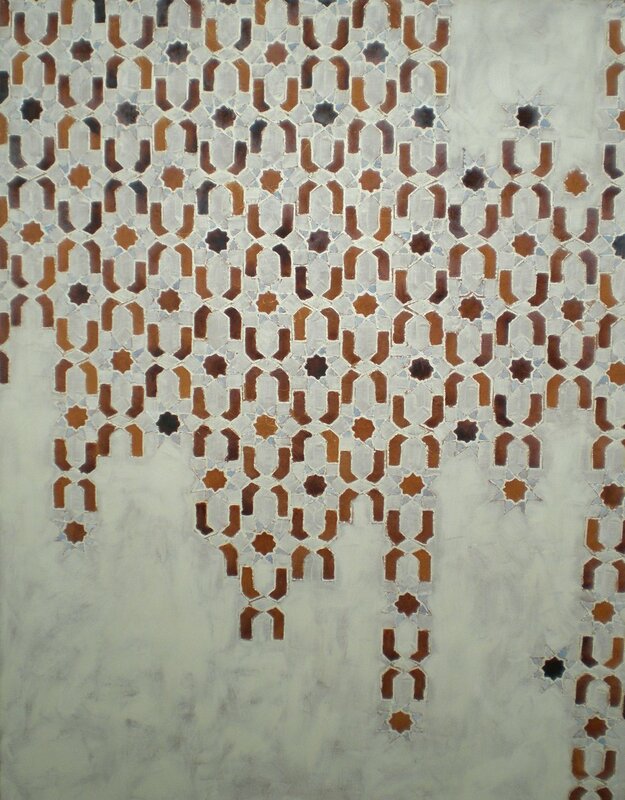 One of the "curve balls" thrown by Squire, I suggest, would be 'Arnold Schwarzenegger' (ink & oil on canvas, 90cm x 70cm). The top half of this work takes the form of a weightlifter lifting a barbell overhead, which could be related to Schwarzenegger's early bodybuilding career. before the game began ?